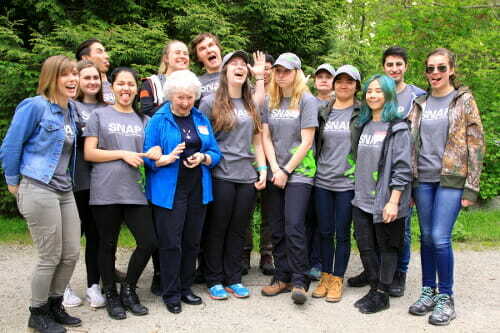 The SNAP team on opening day in May. The team has wrapped things up for this year. Our next GTHS meeting is Wednesday, September 6 at the Surrey Nature Centre. We’ll gather at 6:30 pm, start the meeting by 7:00 pm and wrap things up at 8:30 pm. You are invited, but please email info@greentimbers.ca if you plan to attend. We’re always looking for help! We have loads of tasks, large and small, whether you have a few minutes or a few years (ha!) and want to make a difference. Please email info@greentimbers.ca if you’re interested. SNAP is done for the summer. Thanks Nathan and the whole team for yet another incredible year. Some of the original big wooden signs saying “Green Timbers Urban Forest” need some cleaning and repair. I can think of three: one at 100th and 148th, 96th at about 147th, and one by the parking lot on 100th. Are there any others? Our next AGM is to be held in November. We’ll let you know when we have a date so you can plan on attending. It should be a lot of fun, and informative too! We’ll also get to vote on new bylaws, which is always very exciting. This Saturday, Sept 9 The 19th Annual Surrey Fest Downtown at Holland Park. Surrey Fest Downtown – a Celebration of Community – is one of the largest Community Festivals in Surrey. The festivities will begin at 11 am and will run until 4 pm. We’ll have a table there, so please drop by and say “hi”! About the Author: Don S.